Pork and Celeriac Stew, braised in red wine, Thyme for Cooking main course. 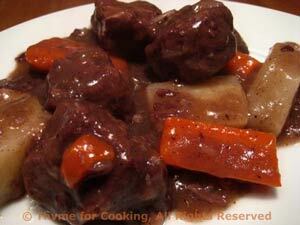 The spices used in this are from a recipe for Wild Boar Stew, but work very well with domestic pork. The juniper berries give it a wintry, woodsy flavor. If you have the time, marinate the pork in the red wine for a few hours before cooking. This makes enough for 2 meals. The cutting: Cut pork into large pieces, 1 1/2" (4cm) cubes. Peel carrots and cut into 2" (5cm) lengths. Cut each piece in half the long way. Cut the celeriac in quarters. Wrap the bit not being used in cling film and refrigerate. Peel the remaining quarters using a vegetable peeler or knife. Cut into sizes similar to or a bit larger than the carrots and keep in water until using. Peel the onion and slice vertically into wedges. The cooking: Heat oil in a large pot or dutch oven over medium heat. Add pork, a few pieces at a time and brown well on all sides. Remove to a plate if it gets crowded. Add Prosciutto, onions and garlic, and sauté 5 minutes. Return all pork to pot, add vegetables, spices, herbs, wine and stock. Cover and simmer 75 minutes. To finish: Remove pork and vegetables. Discard bay leaves. Dissolve cornstarch in water and slowly add, stirring until thickened. Spoon sauce over pork and serve.